I'd be lying if I said I'm not confident in my smile. My parents spent good money on years of orthodontic work to get my pearly whites in tip-top shape. And for that, I'm eternally grateful. My smile is one of the things I get complimented on the most, so I'm forever indebted to my parents' good genes and my hardworking orthodontist. Bless up. However, being the curious beauty editor that I am, I'll never turn down the opportunity to make my smile a little brighter. When the opportunity presented itself to try out laser teeth whitening, I was all in. Like many other beauty treatments that seem cool in my head, I walk blindly into them with minimal information and maximum excitement. A study by the American Academy of Cosmetic Dentistry revealed the annual revenue in the teeth whitening industry topped $11 billion in 2015—$1.4 billion of that spent on teeth whitening products. In short, the hype surrounding whiter teeth is real. As soon as I walked into the office of Marc Lowenberg, DDS; Brian Kantor, DDS; and Gregg Lituchy, DDS, I was greeted with a big smile by Lowenberg, who has a star-studded lineup of smiles under his belt, from Chris Rock's to The Rolling Stones' and Russell Simmons's. A few minutes after meeting me, Lowenberg gave me the lowdown on all things laser teeth whitening, an in-office, noninvasive treatment that uses a zoom light and high concentrations of hydrogen peroxide to create a visibly whiter smile. At the start of the procedure, an employee took a mold of my teeth to create a custom tray for my mouth, which I'd need after I left (more on that later). They gave me safety eyewear and set up a contraption inside my mouth to protect my gums from the strength of the hydrogen peroxide. Kantor did the honors for my first lasering session, applying bleach to my teeth and explaining how this would all go down. My teeth were positioned in place, and I didn't move for 15 minutes at a time during each laser session. Kantor checked in on my teeth periodically and applied more bleach after each one to ensure I'd get the best and brightest results possible. Toward the end of my procedure, I started feeling sharp electric shocks. Kantor warned me that these feelings were normal and are signs of my teeth's sensitivity to the high percentage of hydrogen peroxide. The shocks were bearable, just a tad uncomfortable. Afterward, Kantor and Lowenberg revealed my results, and to say I was happy and thoroughly impressed would be an understatement. My teeth were shades brighter than what they were before. I could not stop staring at them. I was instructed to use my customized tray and apply a lower dosage of peroxide on my teeth for 30 minutes for seven days straight post-procedure to maintain the look of my icy whites. I was also given soothing gel in case I experienced those tingly, shock sensations in my gums again. Here's the game changer: I couldn't eat any colorful foods or beverages for the next week since they could stain my teeth—a hard task. But I stuck to the rules, and I'm glad. It's been two weeks since my session, and my teeth are still frosty white. If you prefer to know what you're walking into when you're trying something new, here's everything the pros want you to know about laser teeth whitening. "The thing about whitening that people don't realize is it does not work on everyone," Lowenberg emphasizes. "The marketing of this industry is so convincing, making everyone feel like they can go get whiter teeth. However, lots of the results have to do with the genetic makeup of your teeth. Some people's teeth are dark because they've stained over the years, and others' teeth are dark genetically—just like the color of your eyes. Sometimes you just can't whiten your teeth enough to see an obvious difference. You never know with anyone until you actually do it. You can sit here through the whole process and not see any difference, or sometimes you'll see a great difference—this varies from person to person." "The bleaching doesn't last forever," says Lowenberg. "We can whiten your teeth in the office, but eventually, it fades back. In order to maintain it, we make you customized trays that you take home with you. Once your teeth are white, you can do it once a month for a half hour—this will maintain the whiteness." "Even when teeth whitening does work, the fade-back period varies from person to person," Lowenberg explains. "Some people's teeth get whiter and they stay that way for six months. While for others, their teeth can get dark again a month later. This is why we make the custom trays because I believe no matter how white they get, you have to maintain them or they will fade back." "When we're doing it in the office, we're using 35% hydrogen peroxide," says Lowenberg. "When you do it at home, it can be anywhere from 7% to 10%. When you're doing an in-office treatment, there's a much better chance that your teeth will whiten." Lowenberg recommends coming for an in-office treatment every six months. You can use the at-home, customized tray to whiten your teeth once a month. "The fastest way of bleaching your teeth in-office is by using a zoom light, which activates the hydrogen peroxide and the bleaching gel, which in turn whitens your teeth.” explains Lowenberg. “The way it works is hydrogen peroxide releases oxygen molecules. The molecules are what lifts the intrinsic stains out of your teeth. We use a concentrated amount of 35% of hydrogen peroxide on the teeth. The zoom light acts as a catalyst to release those oxygen molecules so we can break up the stains in the teeth. Kantor breaks down the difference between treating teeth stains with at-home versus in-office treatments. "Things like oil-pulling, white strips, whitening toothpastes, and charcoal-based cleaners to whiten your teeth are removing surface stains and making your teeth appear whiter," explains Kantor. "Those products don't actually bleach your teeth like professional teeth whitening. What determines how white your teeth are going to get is how concentrated the hydrogen peroxide is, which is a bleaching agent. With our treatment, the peroxide is remaining isolated on your teeth for a significant period of time." Honesty moment: This was the hardest part for me. As a self-proclaimed foodie, colorful foods and beverages fill up my palate. No green juices? Matcha tea? Coffee? Berries? Or hot sauce? I wasn't allowed to eat or drink anything that could potentially stain a white T-shirt. The reason I had to avoid colorful foods and drinks was because my teeth were extra-sensitive to staining in the next seven days post-procedure. I got through it one day at a time. "Right after your teeth are professionally whitened, you can't eat or drink anything with color," Lowenberg told me as my eyes widened. "Don't eat things like spaghetti with marinara sauce, red wine, ketchup, or blueberries. If you're a coffee or tea drinker and you absolutely can't go without it, drink it through a straw. After five days, the new color of your teeth is locked in." "If your teeth are whitened and you can't fight the urge to drink red wine afterward, you can rub Vaseline on the fronts of your teeth," suggests Lowenberg—it's an old-school trick that works. "The vaseline will act as a barrier so it won't allow the liquids that stain teeth to permeate the teeth. Also, if you're going to drink red wine, coffee, or tea, it is imperative that you immediately drink water afterward so that the residue doesn't sit on your teeth and you're washing it away with water." If you want to ease into your teeth whitening process before trying an in-office, try the below products to remove surface stains. 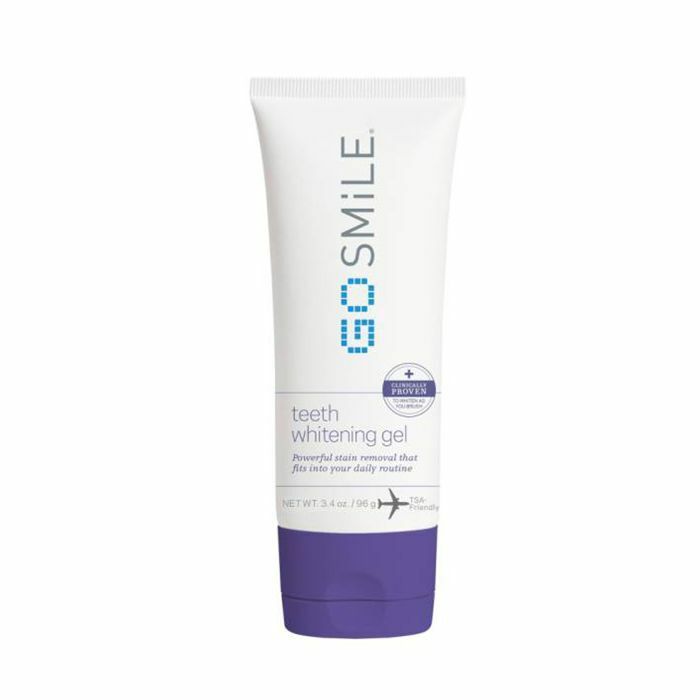 Known for its insanely dramatic results, this teeth whitening gel claims to give you whiter teeth in just two days. 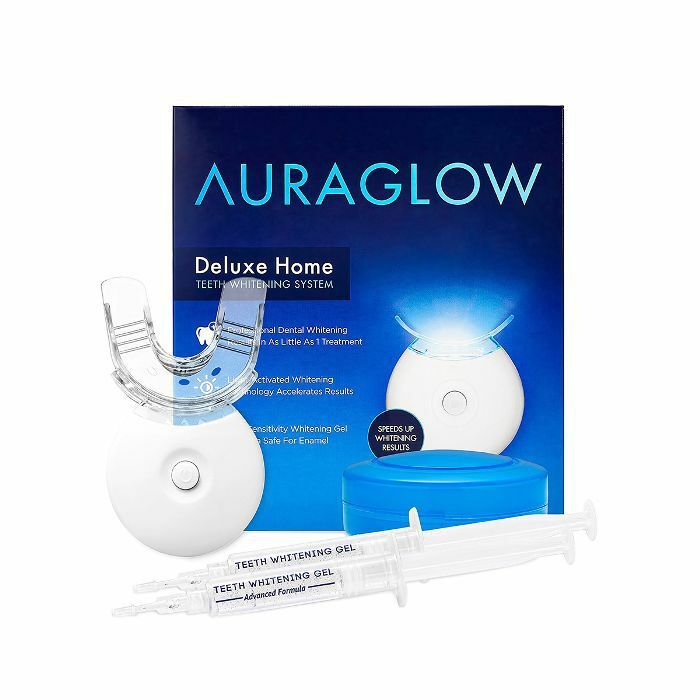 This extensive kit includes two whitening gels, five LED lights, and a flexible tray to deliver an immediate whitening effect. This five-minute system not only whitens your teeth after a couple of uses but also fights tartar and reduces bad breath. This is a popular option because many can attest to its whitening powers. 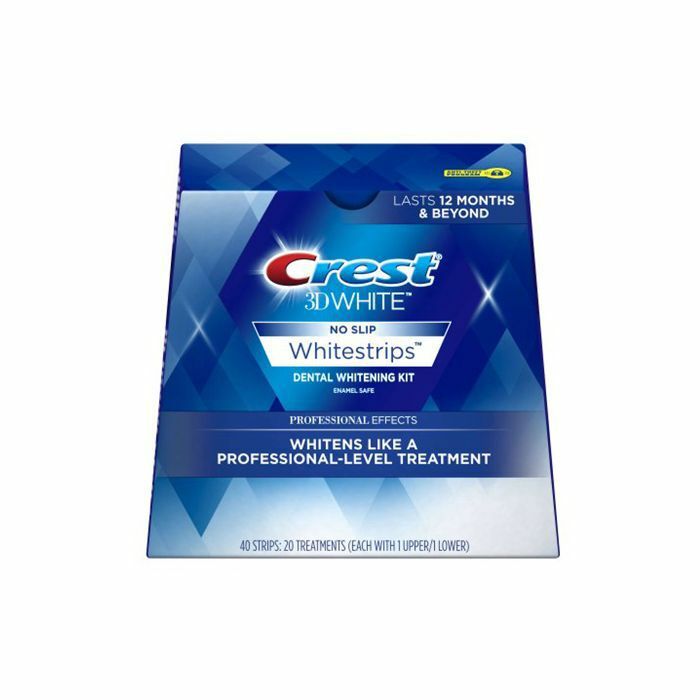 In the span of 10 days, Crest White Strips can diminish the look of surface stains. 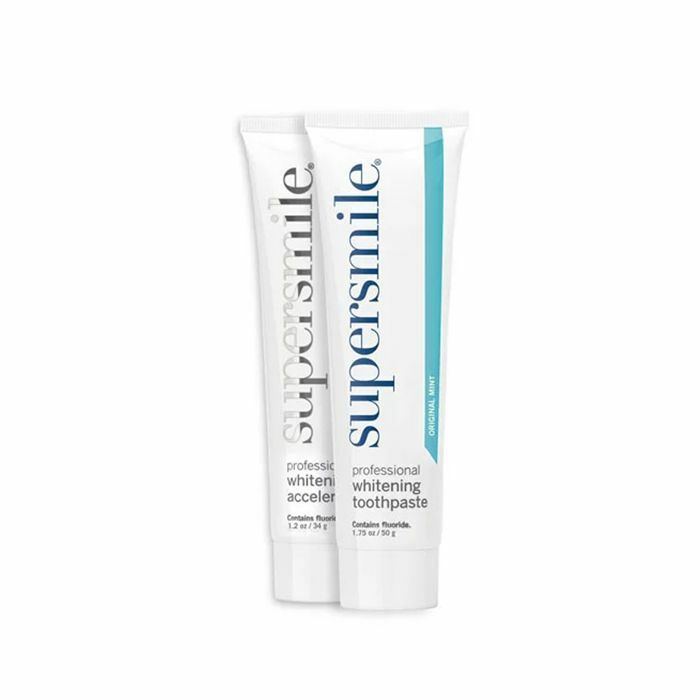 With this two-step system, you get a whitening toothpaste and whitening "accelerator" in one to ensure your smile stays the brightest it can be. If it's been on your mind for a while, hopefully this honest laser teeth whitening review inspires you to take the plunge. Pearly whites ahead.